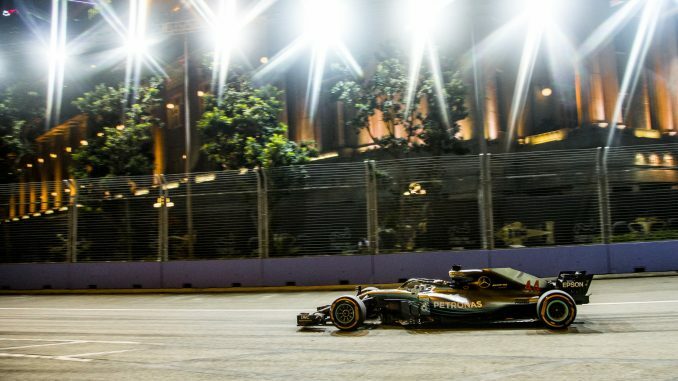 Lewis Hamilton has secured his fourth win in five races with victory at the Singapore Grand Prix this afternoon, with Max Verstappen and Sebastian Vettel joining him on the podium. The pole sitter never really came under pressure as he increased his championship lead over Vettel to 40 points with six races remaining this season. 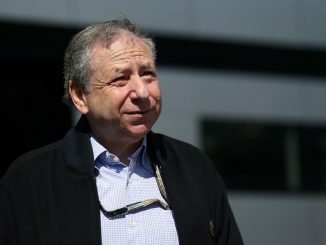 A safety car was needed on the opening lap of the race when the Force India drivers had a coming together, with Sergio Perez pushing Esteban Ocon into the wall, ending the Frenchman’s race. 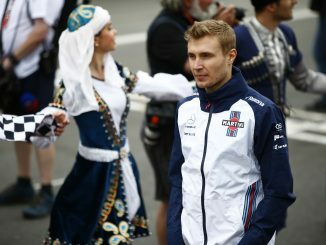 Sergey Sirotkin was also affected by the incident as a bit of debris from Ocon’s car got stuck on the Williams driver’s front wing, resulting in the team having to pit the Russian early. Vettel moved up to second with a pass on Verstappen just before the safety car came out, but the Ferrari driver wasn’t able to get close to Hamilton on the restart. 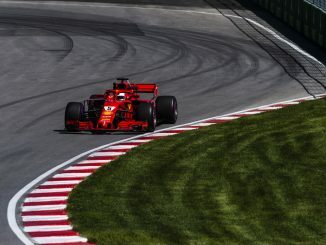 Ferrari tried to get the better of Hamilton by bringing Vettel in first to undercut the Mercedes, but the German got stuck behind Sergio Perez, allowing Hamilton to stop one lap later and retain the lead. The traffic cost Vettel as Verstappen managed to retake second a couple of laps later when he came into the pitlane for new tyres. Sirotkin’s early pitstop meant the likes of Perez and Nico Hulkenberg were stuck behind the slower Williams after their stops. Perez ran out of patience and tried to pass the Williams driver, but moved across the track too soon and the two drivers banged wheels, resulting in a puncture for the Force India driver. It got worse for the Mexican as the stewards blamed him for the collision, resulting in a drive-through penalty. As the leaders caught the back markers, Romain Grosjean and Sirotkin were battling for position, holding up Hamilton and backing him up into Verstappen’s path. The Haas driver was given a five-second penalty for ignoring blue flags as a result. Sirotkin was also given the same penalty, but his infringement was forcing Brendon Hartley wide while the Toro Rosso driver was trying to pass the Williams. Once the leaders were through the traffic, Hamilton was able to open up a lead again, although the battle remained close between Valtteri Bottas, Kimi Raikkonen and Daniel Ricciardo for fourth, with Bottas just having enough to hold off the two drivers behind him. Fernando Alonso was the highest placed finisher from outside the top three teams, while Kevin Magnussen finished the race with the fastest lap after making a late pitstop for new tyres, which also makes the Haas driver the lap record holder at the Marina Bay Street Circuit. *Grosjean and Sirotkin both received 5-second penalties. Grosjean crossed the line 13th but dropped two places as a result.